We’ve had a few support tickets from folks in the United Kingdom, asking how to change the default currency in SpendMap from dollars ($) to pounds sterling (£). The question usually comes alongside another question about how to set up Value Added Tax (VAT) as the default sales tax rate in the system. 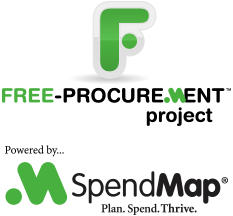 So this blog post outlines the options for changing the default currency and taxes in the free version of SpendMap. I’ll use “pounds” and “VAT” as the examples, but SpendMap supports other currencies and taxes too, which you can set up in the Tax and Exchange Rates Master File. First things first, I guess I should mention that you will be prompted to select your currency and default taxes during the Setup Wizard, which will run automatically when you log into your Live (Production) copy of SpendMap for the first time. Before I get started, please note that the system-wide default currency and taxes that I am referring to here are just that, defaults. Regardless of what the defaults are set to, you can use a different currency and taxes for each Purchase Order. For example, you might do business with suppliers in many different countries, in which case you can assign different currencies to those suppliers in the [Settings] Folder of the Supplier Master File. Similarly, the taxes might be different for each Purchase Order (or even each line item on each PO), based on the type of item that you’re buying, where it is being shipped to, etc. For complete details, please see the subsections called “About currency conversion” and “Defaulting tax codes on transactions” in the Online Help for the Tax and Exchange Rates Master File. That’s it. From that point on, all new Purchase Orders will be in GBP (£), unless you select a supplier that uses a different currency, per the subsection “About currency conversion” in the Online Help for the Tax and Exchange Rates Master File. And from that point on, all new Purchase Orders will include VAT tax, again, unless you select an item, ship-to location, or other variable that overrides the default taxes. For example, some goods and services are subject to VAT at a reduced rate of 5% (such as domestic fuel) or 0% (such as most food and children’s clothing), in which case you might set up additional tax codes (with different tax rates), and assign those taxes to certain items in the Item Master File. Again, for details on the various areas from which sales tax rates can default when you create new POs in the system, please see the subsection “Defaulting tax codes on transactions” in the Online Help for the Tax and Exchange Rates Master File. As you work in SpendMap, you will notice that there are two separate tax fields (called “Tax 1” and “Tax 2” by default). You can use one tax field or both if you pay more than one tax on your orders. For example, most companies in the USA would use a single field as “State Tax” while many Canadian companies might title the fields “Provincial Tax” and “Federal Tax”. Other common examples include “County Tax”, “City Tax”, etc. how to remove footer, spend map logo and ad at the end of our po? Sorry, in the Free Version you cannot remove our logo and link to our website that appear below the Short Terms Text. Thanks for choosing SpendMap and have a great day! Totally free software that automates Purchase Orders and a whole lot more. Could you kindly let me know whether the software supports financial transactions happening in INR (Indian Rupee). If yes, kindly guide me on having it set up. We are a domestic firm located in Bangalore, India and all our transactions are in INR. Kindly help! Hello again Manjunath. Yes, you can use INR as the base/landed currency in your system. Just follow the steps in this blog post to set it up. Per the section “Setup Wizard”, you will be prompted to select a currency when you run the Setup Wizard for your Live System, otherwise you can follow the steps under the section “Setting the Default Currency”. If you still have questions, please reply to the e-mails on support ticket C74733, already in progress. If you’re not getting those e-mails, please check your Junk/SPAM e-mail folder. Thank you.